Come journey with Da'ee Ahmed Moait as he travels to different countries and continents, spreading the powerful message of Allah throughout the globe. Also get an eye-opening view of how different Muslims are living all over the planet. 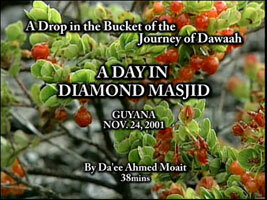 Come experience a day in Diamond Masjid as Da'ee Ahmed Moait gives dawaah to Muslims in a Guyanese town. 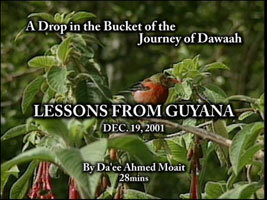 Join Da'ee Ahmed Moait as he gives dawaah in one of the main masjids in Guyana with hopes to wake up the community. Do you want to feel rich, content, and happy??? If so, then this is your video! Learn the keys of happiness and live the rest of your days with a big smile. 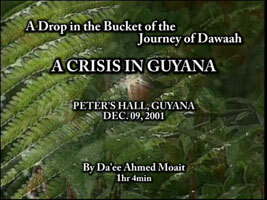 Although this video may not be filmed overseas, Da'ee Ahmed Moait delivers the message of the condition of our Brothers and Sisters in Guyana to a gathering in the United States.